HOOD RIVER, Ore., June 25, 2016 — Matthew Frost, a rising junior at Hood River Valley High School, has just finished making a corner of his world a better place. But not just for himself, it’s for students who, when school starts up, can start receiving medical and behavioral health services at the high school’s School-Based Health Center (SBHC), a satellite site managed by One Community Health. Over the past few months, Frost invested about 70 hours of time to landscape the grounds leading up to and skirting the SBHC, which sits at the high school’s southwest corner. 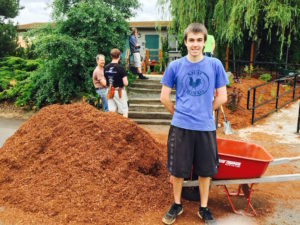 The project included planning for and designing the landscaping, plus collecting donations, recruiting volunteers and implementing what has been his official “Eagle Scout Project,” on behalf of Troop 282 and the entire Columbia River Gorge community. The total project cost $1,000, of which Frost personally contributed $300. To make the project a success, Frost received a number of material and cash donations, plus volunteer support from fellow troop members and a few local adults. Frost would like to thank the following: Bryant Pipe and Supply, Gorge Nursery, Adam’s Bark Dust & Wood Products, Good News Gardening, Walmart, Hood River Valley High School, Providence Memorial Hospital, Alden Gendreau, Connor Traux, Rich Traux, Beren Anderson, Ethan Fowler, Andrew Lemly, Wynn Winfield, Danny Garcia, Rich Polkinghorn, Alec Matthews, Emmet Becker, Michael Becker, Clayton Lee and Frost’s parents, Lynne and Mark Frost. As mentioned, with this project, Frost earns his Eagle Scout rank—the highest achievement in the Boy Scouting Program. For four years, he’s been working on this ranking. Now, he’s got options and a bright future ahead of him in terms of possible opportunities. One Community Health is grateful to Frost and all who contributed their time and resources to the landscaping effort. One Community Health (OCH) is a nonprofit, federally qualified health center with locations in The Dalles and Hood River, Ore. Formerly known as La Clínica del Cariño Family Health Care Center, Inc., it was founded in 1986 and, today, has evolved into an official Patient-Centered Primary Care Home. Today, OCH provides services to over 10,000 patients. In addition, OCH excels in providing proactive educational programs and support that sustain its integrated approach to health and wellbeing. Dedicated to advancing health and social justice for all its community members, OCH serves patients from the Mid-Columbia River Gorge Region: Wasco, Hood River, Klickitat and Skamania Counties. For more information, click here or visit: http://www.onecommunityhealth.org/.